This is a nicer term I came up with for what some people call 'dumpster diving'. However, let me just state that I DO NOT dumpster dive. To me, Coupon Hunting involved only recycling bins and in my case newspaper only recycling bins. While some of you out there may be thinking I'm insane, I implore you to hear me out. I have a very specific system that I follow for this practice. First of all, I will admit this is a controversial practice in the coupon world. The show on TLC called Extreme Couponing showed many of its couponers doing this and this has caused the coupon industry to raise an eyebrow and try to make regulations about it. If you are interested in learning more about that, see Jill Cataldo's article here - the article mainly focuses on the selling of coupons, but it talks about dumpster diving too. Very interesting article. So, with that side note mentioned, I will tell you what I do that I still feel ethical about. I am a huge fan of the recycling areas of apartments buildings and condos. Think about it - many condos especially are filled mostly with seniors and most seniors read the paper everyday. Also, only about 4% of people out there use their coupons. This means a ridiculous amount of coupons get thrown away. And when you are a responsible senior citizen who lives in a condo with sectioned off recycling, you will recycle your paper and coupons instead of throwing them away. So, together with my mom and sisters, we go out at least every 2 weeks to a specific condo recycling area and pull all of the coupons out of the newspapers. The result of this is usually an awesome haul of coupon inserts. The first time we ever did it we ended up with over 60 full inserts and many single pages that had been separated and we didn't know which insert they originally belonged to. Here is just a small example of one of our trips. 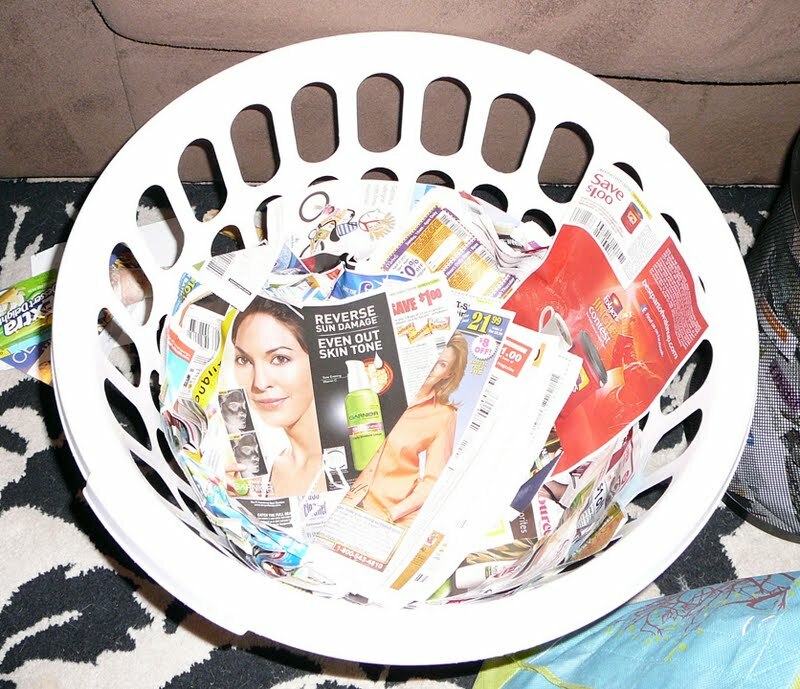 This basket is filled about 6 inches deep with coupon inserts and we had already taken some out to sort them. So, how is this ethical? Have you ever heard the phrase one man's trash is another man's treasure? It is entirely true in this case - and in a very literal sense. I even read one other coupon blogger say that she actually called the recycling center to see if this was legal and they said it absolutely was. While most recycling centers have been forced to not allow people to come search through the newspapers after they have been taken to the center (see that article about that one), before they are in the possession of the recycling center, they are fair game. So, I just make sure to not do any purchases that are too ridiculous. The last thing I want is for my store to get in trouble and stop allowing coupons. I try to be as fair as possible, even splitting my mass of coupons into several separate transactions and on separate days sometimes so I slip under the radar. This is something that everyone just has to form their own opinion about. I can't tell you what is right and wrong, you have to decide for yourself what is ok. Always coupon hunt at night. I like to go no earlier than 9:30 pm since most people are not out and about by then. Even though I don't mind if people see me, I don't like the suspicion so I prefer to avoid being seen. Bring a box or basket to hold your coupons. You will get a bunch, so come prepared to carry them away. Wear gloves - not because the bins are gross or anything, they should be pretty clean. But newsprint ink is notorious for rubbing off on your hands so you will be black by the time you are done otherwise. Bring a friend - not only for safety reasons, but to make the time pass quicker and have fun! I mean, you're rifling through a trash bin, have fun with it! Don't try to clip them all! I tried this the first time and my fingers went numb from all the cutting and I didn't even make a dent. Organize your inserts by putting the same ones together. Then look through each different one and just clip out the coupons you know you are going to need immediately and save the rest in case you need to go back and clip others for a later sale. So, hopefully you don't all think I'm crazy. You don't have to do it to the extent that I do. Just check your neighbor's recycling bin when you walk the dog at night and see what you find! This is the best way to get a bunch of coupons quickly - I promise it will be worth it!